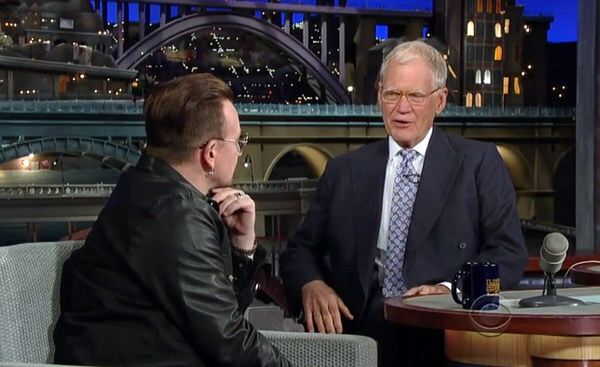 What Bono told Letterman last night about ONE, RED... oh, yeah, and that next U2 record. Take your time lads ur next album will be epic !!! Been waiting so long - can't wait to hear and see NEW U2!!!! Cheers for a new album early in 2014! Can't wait for musical greatness... But: I want an album with four or five singles! And with loads of b-sides that are original tunes, not remixes... I want a number one, and two top tens... I want a tour that starts each show with eight songs from the new album, hammering the audience into bliss... I want every encore to include With or Without You, and include the extra verse, you know the one, "Yea, we'll shine like stars in the summer night"
Please get it do. We need it now!!! It was nice to hear Bono and Letterman talk in a relaxed and humorous manner. Listening to Bono´s statements about the Spider-Man musical, his daughters´ work, social activism and the upcoming U2 album was enjoyable. I appreciate his ambition to make music that is truly great. For me greatness combines technical abilities, creativity and the release of sincere emotions that touch our hearts. I hope to hear a new U2 album soon! Bono You are a true champion. Fighting so hard to help people. I agree with you that helping Africa fight disease is a really smart way to fight terrorism. By helping and not hurting, we win over people to love us. By the way, we love you too. Bono mentioned a new album???? Ok, he said it has to be great??? Obviously. We need to be patient and wait???? Alright, just as long as they mention it from time to time, to keep my faith, I mean. ONE and RED, the best!!!! Amazing... Thank you very much for posting this!! I'm glad to see him!